The International Bank Note Society (IBNS) voted to select the Swiss National Bank as the winner of the “Bank Note of the Year Award” for 2017. With nearly sixty other candidates, the Swiss 10 Franc edged out designs from Fiji, Royal Bank of Scotland and Canada. The 10 Franc is the fourth hybrid/polymer bank note to win this award. 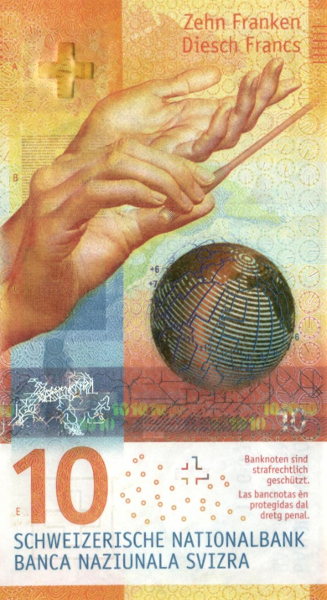 The Switzerland 10 Franc note is part of the first new design the Swiss National Bank has released in 20 years. Printed by Orell Fussli Security Printing Ltd. in Zurich, all notes from the new 9th series feature national experiences and abstract themes. 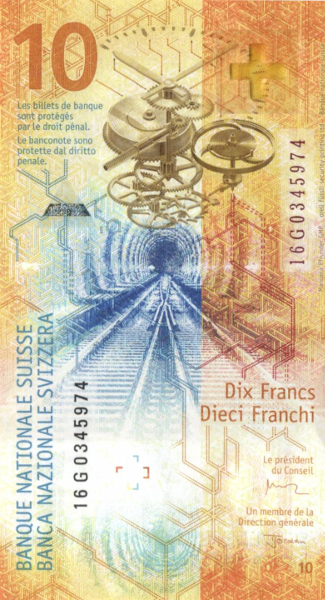 Incorporating the latest in technological security standards and using three layer substrate Durasafe®, this gorgeous yellow vertical banknote depicts human hands conducting an orchestra with a globe showing time zones and the punctual Swiss rail system. More information about the International Bank Note Society can be found here.